Dynaudio’s rich pedigree in speaker design makes itself heard in these stylish new designs! What is it about Scandinavia and speakers? Maybe there’s something in the water that steers young engineers towards electro-acoustics? 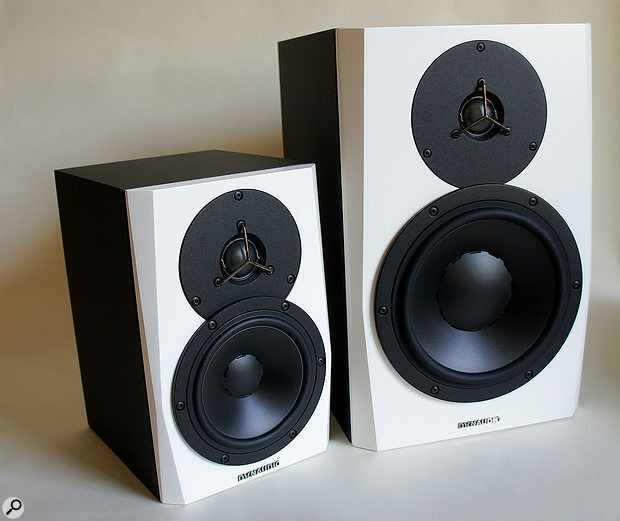 You see, not long ago within these pages, I wrote about the Amphion nearfield monitors from Finland. Then there’s Genelec from the same neck of the woods, and Dynaudio, the Danish company behind the subjects of this review. And moving away from the pro-audio sector, but still within the realms of serious electro-acoustics, there are of course Bang & Olufsen — and there’s even a recent book on the subject of Danish speaker design: www.danishsound.org/da/article/danish-loudspeakers-100-years-0. 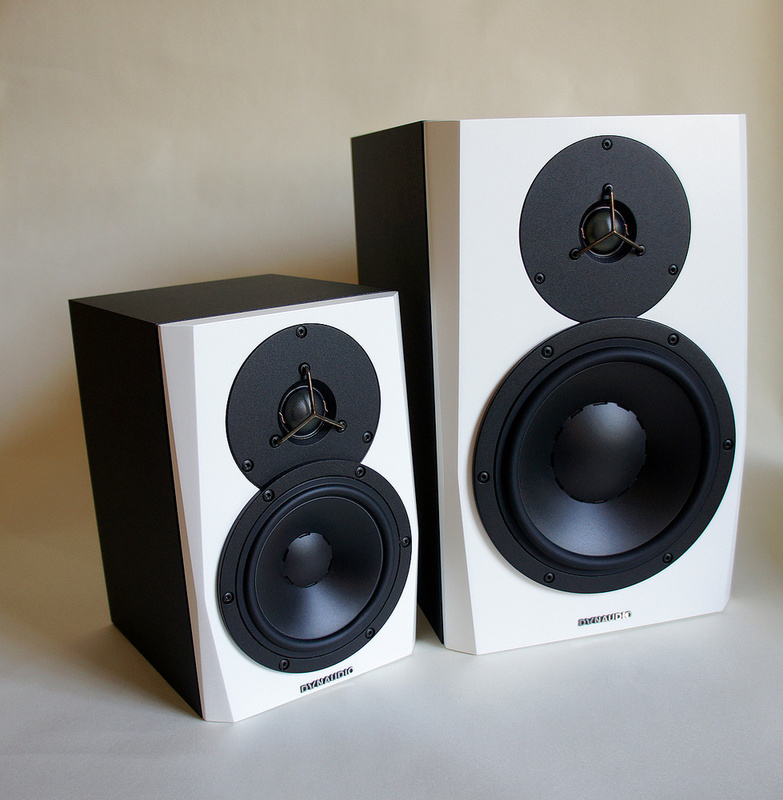 Scandinavian success with speakers goes deeper than a few well-known monitor and hi-fi companies, however. The region has also long been known among speaker engineers for its specialist component driver manufacturers — Peerless, Vifa and Scanspeak in Denmark, and SEAS in Norway, to name the best-known four. The UK speaker industry would undoubtedly have been far less able to grow in the last decades of the 20th Century without access to those Scandinavian drivers. So Scandinavia is not just the home of minimalist design, Lego, groundbreaking contemporary jazz, innovative ways of preparing fish, and Ikea, it’s also a region of excellence in speaker design. In contrast, therefore, to a couple of monitors I’ve reviewed recently from young companies with little in the way of electro-acoustic heritage, the Dynaudio Lyd 5 and Lyd 8 represent the work of an organisation with roots right back to the early days of nearfield monitors. 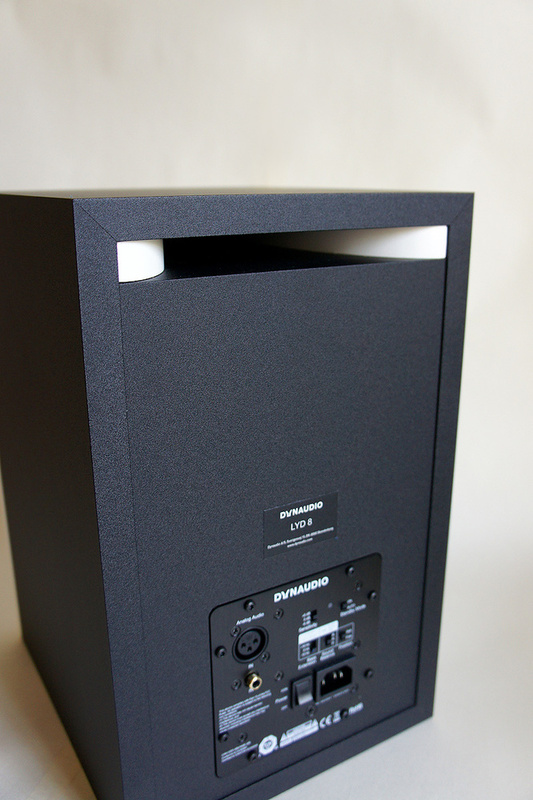 Dynaudio were established in 1977 by Wilfried Ehrenholz, Gerhard Richter and Ejvind Skaaning. The company quickly developed a reputation for their innovative, holistic approach to speakers and electro-acoustics — an approach that was often at odds with the conventional thinking of the day that majored almost exclusively on frequency response. One example of the innovative Dynaudio approach was an unusual driver construction technique that is still employed on many of the company’s monitors today. I’ll describe that driver construction a little later, once I’ve introduced the Lyd 5 and Lyd 8. The Lyd range comprises three compact active nearfield monitors, the 5, 7 and 8. We chose to examine the 5 and 8 partly because it seemed to make some kind of sense to look at the monitors at either end of the range, and partly because the more expensive and ambitious Lyd 8 incorporates one of those characteristic Dynaudio-style LF/MF drivers. The first thing to say about both the Lyd 5 and Lyd 8 is that they look even better in the flesh than they do in 2D images. My 12-year-old daughter, who of course is fast becoming the arbiter of style in this household, described them as both “cool” and “awesome”. What more do you need to know? Well, they break no new ground in terms of shape or proportion, being entirely rectilinear apart from the trademark Dynaudio bevelled front edges, but the sharp white of the front panels contrasts classically with the black of the drivers and cabinet panels to create a look that is unmistakably Scandinavian, and unmistakably classy. On both monitors the reflex port is created by an internal shelf with an aperture at the back the cabinet. Within the aperture are two moulded inserts that create a generous port flare; the inserts are finished in the same white as the front of the cabinet and the aesthetic effect this creates is both novel and striking. A second thing to say about the Lyd range is that all three monitors are more competitively priced than I originally imagined they would be. They are not quite at the ultra-competitive entry-level price points for serious nearfield monitoring, but they’re not far off. It was a pleasant surprise also to find that the Lyd range is predominantly manufactured in Denmark rather than in the Far East. Competitive pricing and European manufacture is, I think, quite an achievement and Dynaudio should be applauded for it. In terms of size and scale, the Lyd 5 is a genuinely compact monitor of only 5.5L internal volume. Its driver complement comprises a nominally 145mm reinforced-polymer cone LF/MF unit and a 28mm doped-fabric dome HF unit. In traditional Dynaudio style, the un-rebated chassis of the LF/MF unit overlaps the front plate of the HF unit a little. The overlap creates an attractive, integrated aesthetic to my eyes, and also helps get the acoustic centres of the two drivers just that little bit closer together. The Lyd 5 Class-D power amplification provides 50 Watts each for both the LF/MF and HF drivers, and the crossover frequency is set at an unusually high 5.2kHz — more about that further down the page. The Lyd 8 is a significantly larger monitor than the Lyd 5 but still inhabits the ‘nearfield’ camp in terms of scale. Its drivers comprise a dome HF unit similar to the one fitted to the Lyd 5 (the only apparent difference is the greater front plate diameter) and a significantly larger 200mm reinforced-polymer cone LF/MF unit. The Lyd 8 enclosure internal volume is around three times that of the Lyd 5 and its Class-D power amplification provides 80 Watts and 50 Watts respectively for the LF/MF and HF drivers. While the 3.9kHz crossover frequency of the Lyd 8 is not quite as high as found on the Lyd 5, it is again significantly higher than would normally be found on similar monitors. As I touched on earlier, the Lyd 8 LF/MF driver features Dynaudio’s unusual construction technique. I also promised a description, so here it is. 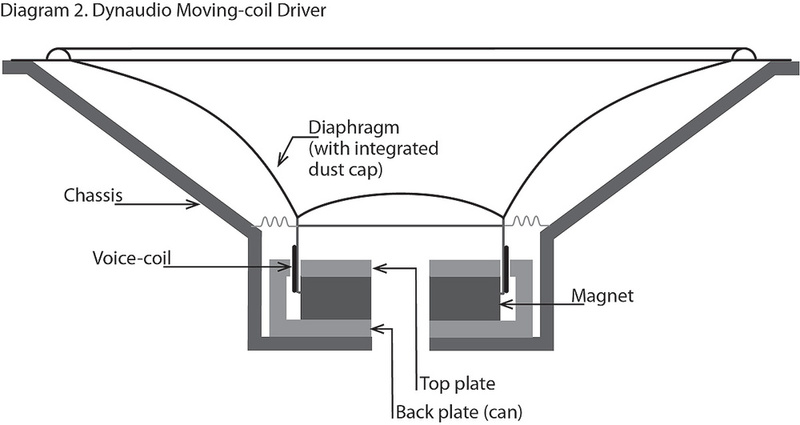 The conventional arrangement of driver voice coil and magnet sees a relatively small-diameter voice coil wound on a former encircling a metallic pole piece. Circumferentially around the voice coil, located nominally halfway along its length, is a metallic top plate. A doughnut-shaped magnet energises the pole piece and top plate on opposite poles, with the voice coil ‘immersed’ in the magnetic field in the gap between the two. This is all illustrated in Diagram 1. Diagram 1: A traditional moving-coil driver construction. The Dynaudio ‘external voice-coil’ construction comprises a much larger-diameter voice coil encircling not a pole piece but the doughnut magnet itself. An internally flanged metallic ‘can’ then encloses the entire assembly from the bottom of the magnet, and a top plate is mounted on top of the magnet. The voice coil then moves in the gap between the top plate and the flange of the can. There is no pole piece. Diagram 2 illustrates this external voice coil construction. Diagram 2: Dynaudio’s ‘external voice-coil’ driver design. There are of course advantages and disadvantages with the external voice coil. I’ll cover the advantages, as I see them, first. To begin with, a far larger voice coil brings significantly greater thermal power handling and reduced thermal compression. The larger voice coil also means that the diaphragm is driven not from near its apex, as is the case with conventional drivers, but from much further out. This can help significantly in controlling diaphragm break-up behaviour as frequency rises above that at which the diaphragm is able to move as a whole (which, as we’ll see, probably has some relevance to the Lyd 8 system design). Another advantage is that the hole behind the dust cap, where the pole piece would otherwise be, allows free passage to the air pumped backwards and forwards by the dust cap. And speaking of the dust cap, Dynaudio Lyd LF/MF drivers (on the Lyd 5 as well as the 8) are unusual in having the cone and dust cap formed in one piece. More often than not, in conventional drivers, the dust cap is a separate component stuck to the cone by a bead of glue. And disadvantages? Well, to start with, a larger voice-coil is also very likely to be heavier, which means a larger and more powerful magnet is required. Some compensation for the extra weight can be achieved by using copper-clad aluminium voice-coil wire, but even so, the large voice-coil former is still an issue. Furthermore, despite the lack of a pole piece and consequent free passage of air, external voice-coil construction also tends to results in a significant reflective surface, namely the magnet, directly behind the dust cap. Generally, more of the rear side of the diaphragm is blocked off by the chassis and magnet than on a conventionally arranged driver. 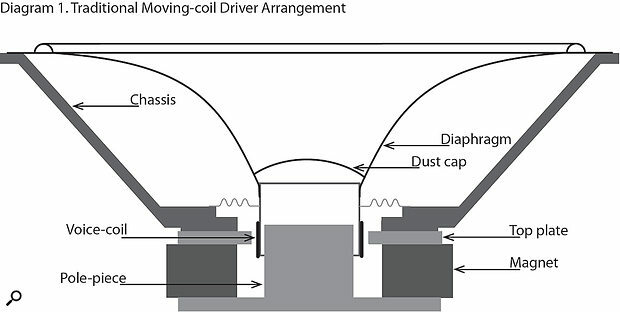 External voice-coil construction also makes providing sufficient diaphragm movement, while keeping the voice-coil former short (and therefore stiff), more complex than in a conventionally constructed driver. The manufacturing process is slightly more tricky too. Dynaudio have stuck with their external voice-coil construction technique for many decades now and there’s little doubt that the technique can result in some seriously high-performance drivers — such as the Lyd 8 LF/MF driver, which Dynaudio say is perhaps their best ever 200mm unit. I’ll write about its subjective performance a little further down the page but there’s one aspect of the way it works that’s revealed by measuring the Lyd 8 frequency response, and it ties in with Dynaudio’s decision to use an unusually high 3.9kHz crossover frequency. Brace yourself for a little acoustic theory. If you go to your bookshelf, select your usual acoustics reference text book (I know you have one) and turn to the page where it describes the frequency response of a simple, infinitely rigid diaphragm, you’ll see that the off-axis response will begin to decay noticeably by the time the wavelength gets to around the diaphragm diameter — around 2kHz for a diaphragm the size of the Lyd 8 LF/MF driver. A 30-degree off-axis response measurement of the Lyd 8, however, as illustrated in Diagram 3, shows that it does no such thing. The output has only dropped by around 2dB by the 3.9kHz crossover frequency when, in theory, it should be around 6dB down. So what is going on? Because as a fictional Scottish engineer once (or twice) bellowed, “You cannae break the laws of physics, Jim!” Diagram 3: The on-axis (light green) and 30-degree off-axis (teal) frequency responses of the Lyd 8. What’s going on is that at 3.9kHz, the effective diameter of the driver is no longer 200mm. There are very few materials from which you can make a diaphragm that is both light enough to work in a 200mm driver yet rigid enough to still be moving as a whole at 3.9kHz. Actually, it’s fewer than very few. So at 3.9kHz, due to the flexibility of the diaphragm material, its extremities will have effectively stopped moving, leaving only the central region radiating audio. This of course is easier said than done, and requires no little skill to engineer, but thanks to the Dynaudio external voice-coil construction, with its diaphragm driven not at the apex but significantly further out and with its integrated dust cap, the engineering probably becomes a little easier. It contributes significantly, I think, to making the 3.9kHz crossover frequency feasible. Diagram 4 shows the same response comparison for the Lyd 5 and, again, its 30-degree off-axis response is very well behaved, despite the even higher 5.2kHz crossover frequency. Of course that higher crossover frequency is accompanied by a very much smaller LF/MF driver than that fitted to the Lyd 8, and because its diaphragm is small, any advantage gained by external voice-coil construction would probably not be so significant (and actually, the disadvantages of external voice-coil construction would become more significant). Once again though, the integrated dust cap probably helps control the diaphragm behaviour and enables the LF/MF driver to keep going almost an octave higher than such a driver would typically be used. Diagram 4: The on- and off-axis responses of the Lyd 5 (orange and blue traces, respectively). So, I’ve described perhaps how the Dynaudio Lyd monitors manage their high crossover frequencies, but not explained why such a thing might be a good idea. Working the HF driver less hard will benefit power handling and thermal compression effects, and also perhaps reduce distortion levels. However, Dynaudio say that the primary motivation is to get the crossover frequency, with its potential response discontinuities and phase changes, out of the region where the human ear is at its most sensitive. This is a laudable aim and I think a genuinely sound principle, however there are numerous good nearfield monitors available that take a different view on crossover frequency and place it significantly lower (Amphion monitors for example, and their 1.6kHz crossover), so as ever with speakers there’s no unambiguously right answer. Moving on, the Lyd range conforms to the usual active nearfield monitor practice of a rear connection panel that also offers a range of EQ and setup switches. The panel and its switches are identical on both monitors. Signal connection options are balanced XLR and unbalanced phono, and despite the Lyd range having internal DSP, and hence A-D conversion, there’s no digital input option. Dynaudio’s justification for the lack of a digital input is partly cost and partly that, at the Lyd price points, they believe relatively few customers are likely to have a DAW interface or monitor controller with a suitable digital monitor output. The Lyd DSP runs at 24-bit/96kHz, so there’s an argument that, if you habitually work at a higher sample rate, the Lyd range is not for you. Again though, users that fall into that category will be few in number. Maybe of more concern to some with the Lyd’s digital nature is that the DSP will result in some in/out latency. Dynaudio estimate the latency to be around at 30 samples, which at 96kHz equates to around 0.3ms, but I measured it using FuzzMeasure at nearer to 1ms. Research referred to in Hugh Robjohns’ feature on MQA in the August issue (http://sosm.ag/2cVfIwE) suggests that the ear is able to discriminate very much shorter time delays than that, but I think the Lyd’s latency is still very unlikely to be an issue — especially when the fundamental electro-acoustic low-frequency latency is likely to be significantly greater. The rear panel plays host to the input connections and EQ controls, as well as the flared port opening.The Lyd rear panel EQ and setup options are all selected via switches so there’s thankfully no need for my traditional moan about variable controls being hard to set identically on both monitors. The options comprise three low-frequency bandwidth settings, three tonal balance settings and a wall proximity setting. The bandwidth settings enable the monitor’s low-frequency roll-off to be moved up or down from 45Hz to 65Hz in 10Hz steps on the Lyd 8 and from 50Hz to 70Hz in 10Hz steps on the Lyd 5. Each 10Hz step downwards also results in a 5dB reduction in each monitor’s potential maximum volume level (this is because, as low-frequency bandwidth is extended, the LF/MF driver diaphragm is required to move further). The tonal balance options also provide three settings. They are labelled B, N and D for ’bright’, ‘normal’ and ‘dark’, and as might be expected they serve to brighten or darken the overall balance. They operate by ‘tilting’ the overall response either side of 1kHz. Readers of a certain age will perhaps remember the similar Quad hi-fi preamplifier ‘tilt’ control. The ‘dark’ setting attenuates the level at 20kHz by 1.5dB while simultaneously increasing the level at 20Hz by the same amount, and the bright setting does the opposite. The ‘tilt’ switch is a subtle approach to monitor EQ that I really like. It can usefully help to tune the tonal balance of a monitor to the broad properties of a listening environment without wildly changing its character, as some more rudimentary EQ options can sometimes do. The final EQ switch is labelled ‘Wall’ and ‘Free’ and is designed to provide compensation for low-frequency gain when the monitors are used in close proximity to a wall (Dynaudio mention a 0.5m distance). Establishing exactly what this option does is not easy, however. Dynaudio say it is not just simple EQ but incorporates some ideas (and presumably signal processing) that they are unwilling to divulge thanks to a possible patent application. So finally, how do the Lyd monitors perform? I began with the Lyd 8, listening to a combination of well-known CDs and my own ProTools projects, and it was obvious from the first moment that this is an extremely capable nearfield monitor. A distinctly even-handed tonal balance and (other than a very mild cabinet panel character) a lack of any majorly distracting coloration through the mid-range was combined with a good level of fine detail and a well-focused (if maybe slightly flat) stereo image. The Lyd 8 fundamentally displays all the signs that the electro-acoustic design is properly sorted and that the compromises inherent in designing speakers have been well handled. I’ll mention the Lyd HF driver, but it primarily demonstrates its class by not drawing attention to itself. There’s four decades or more of soft-dome HF driver design experience in Denmark and the Lyd HF driver clearly benefits. Who needs ceramic or metal-dome or ribbon drivers, when an ‘old-school’ fabric dome can work so well? The HF driver is delicate and detailed and seems entirely without vice (perhaps helped by the high crossover frequency). It would offer real confidence for example when making calls on vocal sibilance. For what it’s worth, because rooms and personal preferences obviously differ, I settled on the non-extended bass setting, the ‘dark’ tilt setting and the ‘wall’ proximity setting for the Lyd 8 — although I’m really not sure how effective the proximity switch was as it didn’t appear to have a hugely obvious effect in my room. If I have any criticism of the Lyd 8 it was brought about by trying the -10Hz extended LF setting, which to my ears seemed to be a step too far in terms of bass quality. With the LF extended the Lyd 8 bass seemed to take on a slightly less precise character. I reverted to the non-extended option, but of course once a monitor characteristic is heard it’s difficult to un-hear it. So from that point I was never entirely sure of the Lyd 8’s bass. Context is important here though and I’d happily take the Lyd 8’s other fine qualities and invest the time to understand and learn its ways with bass. And the Lyd 5? Well to begin with, it’s obviously cut from the same cliché as the Lyd 8 — the similarity of character, tonal balance and overall feel is unmistakeable. And, even though the Lyd 5 is the less expensive of the two monitors, I actually preferred it. To my ears, its stereo imaging was more precise and focused than the Lyd 8 and in general terms it seemed more coherent — there was more of a sense of listening down into the layers of a mix. The Lyd 5’s low-frequency bandwidth was understandably less extended than the Lyd 8, but, perhaps thanks to being less ambitious in terms of low-frequency extension it lacked the Lyd 8’s occasionally unsatisfying bass character. Perhaps the Lyd 5 reflects that old electro-acoustics design truism that small speakers are often easier to make work than larger ones — partly because smaller cabinets resonate less and don’t compromise dispersion quite so much, and partly because smaller LF/MF drivers are less compromised by the physical limitations of diaphragm materials. Whatever the reasons, for me, the Lyd 5 is the star performer of the pair. If you asked me, and I’m sure you did, to come up with one phrase to describe my feelings about the Lyd monitors it would be ‘engineering integrity’. There is, to my way of thinking, something genuinely satisfying about the way in which their design and engineering hang together — it even extends to a thoughtful and informative user manual and really classy packaging design. While the Lyd 5 was my favourite of the two, both are I think easily competitive with the best monitors at the price, and when you factor in the complete package of aesthetics, style and general coolness, it’s really hard not to like them a lot. There’s obviously no shortage of active nearfield monitoring options around the price of the Lyd 8 and Lyd 5. Some of the strongest competitors are probably the Pioneer RM-05 and RM-07, the Focal Alpha 50 and Alpha 80, the Genelec M030 and M040, and the Adam A7X and A8X. Lyd 8’s bass slightly soft. Both the Lyd 5 and Lyd 8 are classy and capable nearfield monitors invested with thoughtful electro-acoustic engineering. They look great, their performance is up there with the best in their class, and that they’re relatively affordable only increases their appeal. Lyd 5 €998, Lyd 8 €1398. Prices are per pair, including VAT. Lyd 5 $1198, Lyd 8 $1578. Prices are per pair.